Plankton Mania 2015 - The SpongeBob Moves In Guide Site! Plankton Mania 2015 Event Guide! What happened to Plankton? That's the question players have been plaguing Nickelodeon with since the launch of "SpongeBob Moves In" back in June of 2013. Well, on January 12th, Nickelodeon finally pushed Version 4.24.00, bringing to players the long-lost single-celled organism we know as Plankton! Unlike other past major events, this event didn't have a dedicated loading screen art. Unusual, but at least, they still gave it a special App icon. We decided to feature this release as a full-scale event, and we've compiled plenty of content for you to get an overview of all the new features released in this version. We hope you'll enjoy this guide! You've waited long, now go and have fun with Plankton! Plankton arrives in Bikini Bottom! After all this while (at least till 1/12/15), players have been wondering, "Where's Plankton"? Well, the most obvious answer was that it hadn't been released yet. And that was true, until now. Turns out that Plankton had originally attempted to move in the Chum Bucket into Bikini Bottom the same time Mr Krabs moved in the Krusty Krab. Unfortunately, it was too tiny it got crushed soon after! Plankton then disappeared to an Undisclosed location in Bikini Bottom to plan his "grand" entry back into Bikini Bottom! So what's the deal this time? Well, Plankton has discovered that freezing his Chum makes it taste better and he decides to freeze chum and then start selling it to Bottomites! Plankton, being tiny and all can be a little tough to find, especially when your town's really packed. 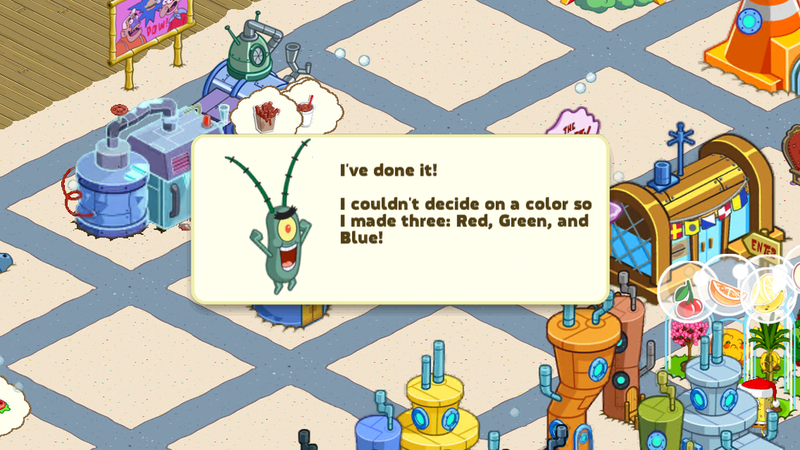 Still, it's great to finally have Plankton in the game, dont'cha think? Move In the Chum Bucket! So where's Plankton going to stay? Well, that question has a pretty obvious answer. The Chum Bucket, of course! 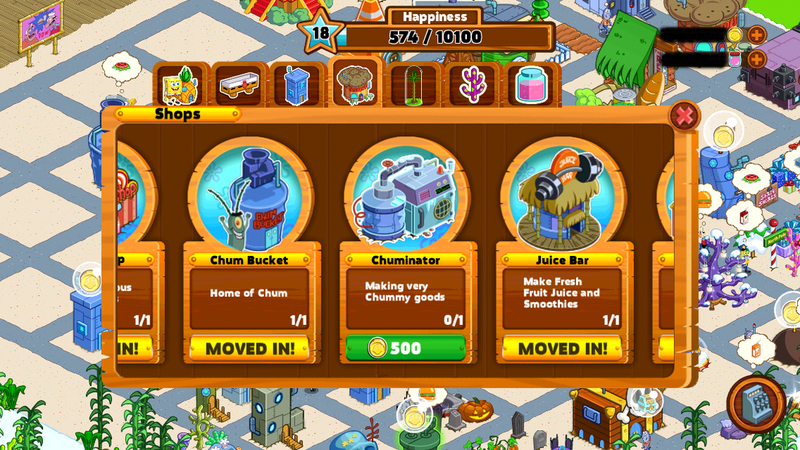 At the beginning of the Plankton quest line, you'll be required to move in the Chum Bucket, which you'll be able to find in the store as depicted above. 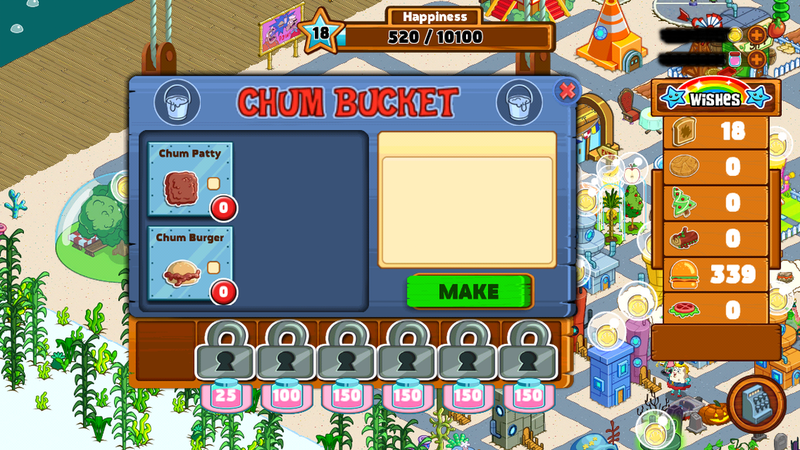 The Chum Bucket works exactly like the Krusty Krab and other consumable producing stores. For starters, you'll be able to serve up Chum Burgers, Chum Fries and Chum Shakes. You can also collect other Plankton-themed recipes by feeding Plankton and his robots Chum food, which we'll elaborate on further below. Apparently, Plankton uses the highest-grade Chum, made personally by him in his own lab/kitchen that we've all assumed was residing inside the Chum Bucket itself. Well, in "SpongeBob Moves In", you can move in the Chuminator! 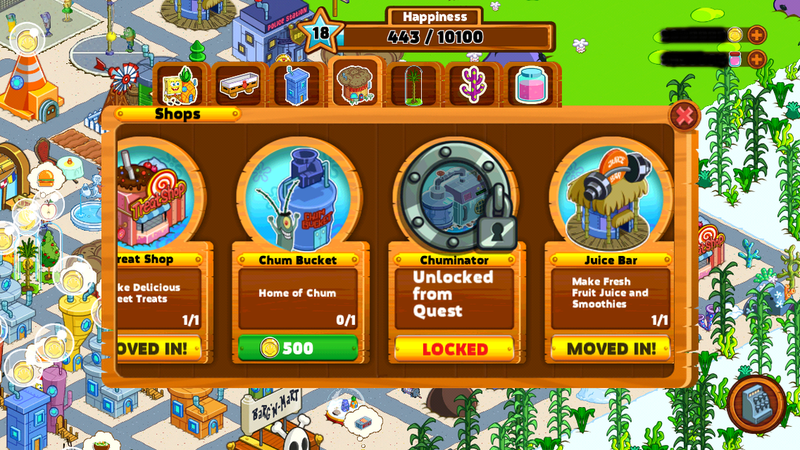 Well, the quest line requires that you move it in, but nonetheless, you'll be able to produce the raw ingredients required to make Chum food in the Chum Bucket! You won't get any new characters from this building, but at least it brings you a step closer to collecting all those awesome (but hideously disgusting to the regular customer) recipes! One great feature in "SpongeBob Moves In" is how certain quest lines, especially for events, are themed after episodes from the show. 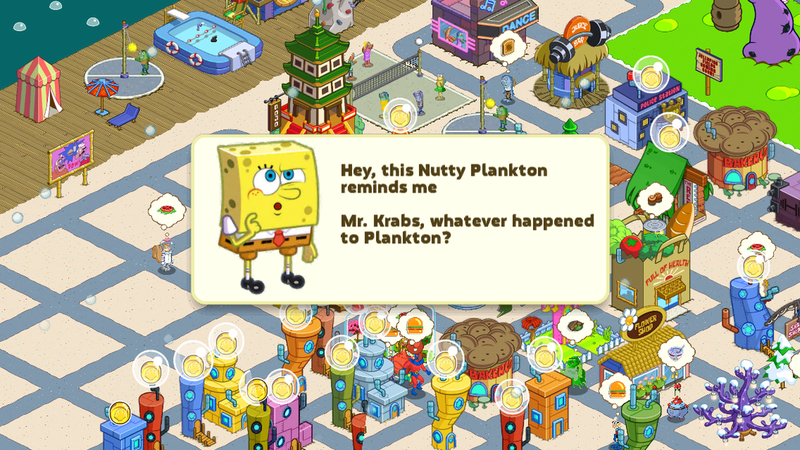 In this case, Nickelodeon has decided to make several episodes featuring Plankton into quest lines, for the month o January 2015. We haven't been able to confirm whether the quest lines are permanent, but if you already are able to start the quest lines, do go forward and do it! 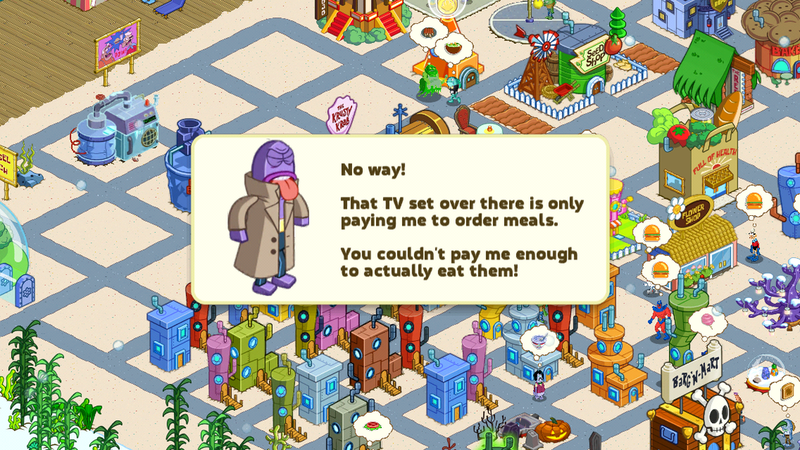 Hopefully, Nickelodeon will also implement more of such quest lines for other characters as well! Imagine re-living "Help Wanted" in the game! Won't that be amazing? Well, we think it is! 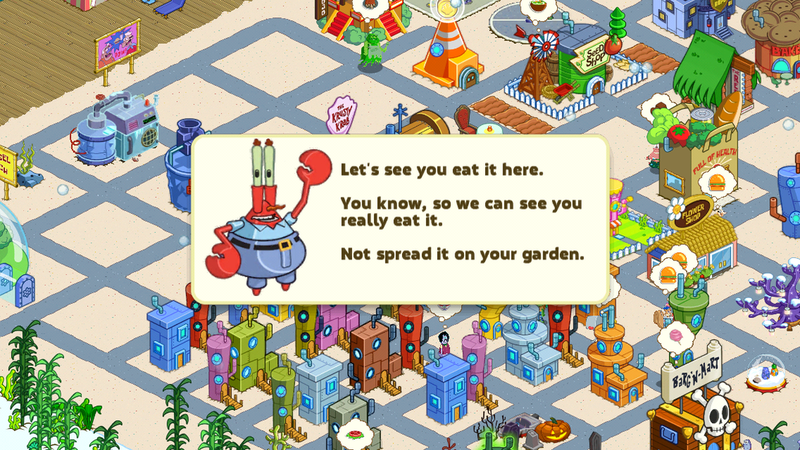 Visit our Quest Guide for this event if you need help to complete the quests or just simply look back at the really long dialogue featuring SpongeBob, Patrick, Mr Krabs, Plankton and Karen here! Unleash the Robots of the Chum-volution! As part of the "Revolution" quest line which takes cue from the Season 6 episode "Komputer Overload", Plankton has decided to build robots that will actually help him steal the Krabby Patty Formula. You might remember P119A from the episode mentioned above, but in this game, you'll actually be moving in not one, not two but three robots! P119A, P119B and P119C, each painted with a different color, Red, Green and Blue respectively. Apparently, these robots can actually eat food...well to be exact, Chum. After all, it would be quite ridiculous for Plankton to program them to wish for Krabby Patties right? 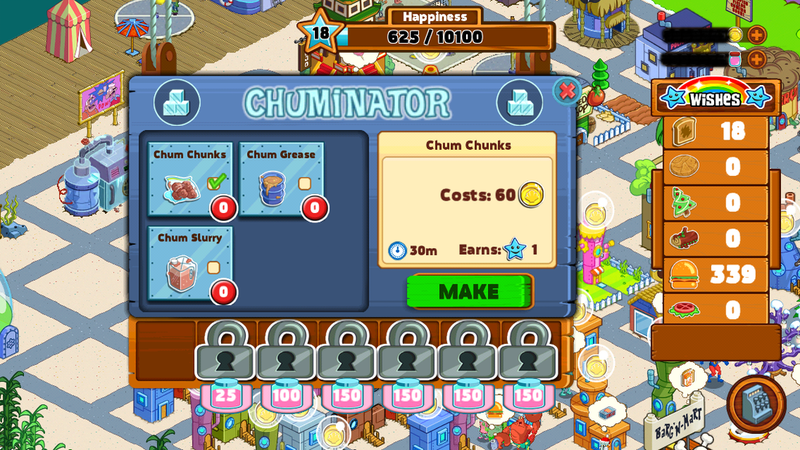 You'll be starting out with Plankton's classics, the Chum Burger, Chum Fries and Chum Shake, but you can actually earn new Chum recipes by feeding Plankton and his three robots (which you will unlock after building Plankton's Lab) with Chum food. We've compiled a list of all the unlockable recipes for your convenience below. Happy Collecting! 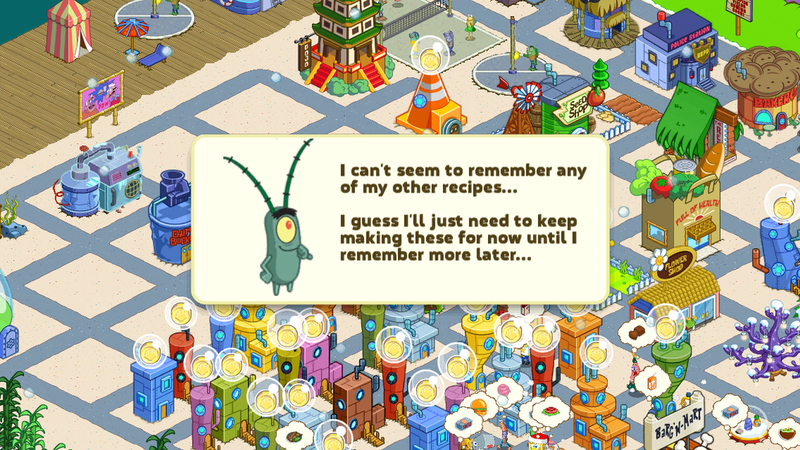 Remember, you can ONLY obtain recipes by feeding Chum food to Plankton and his robots. Plankton-themed Decorations in the Store! As with every new event, comes new decorations! 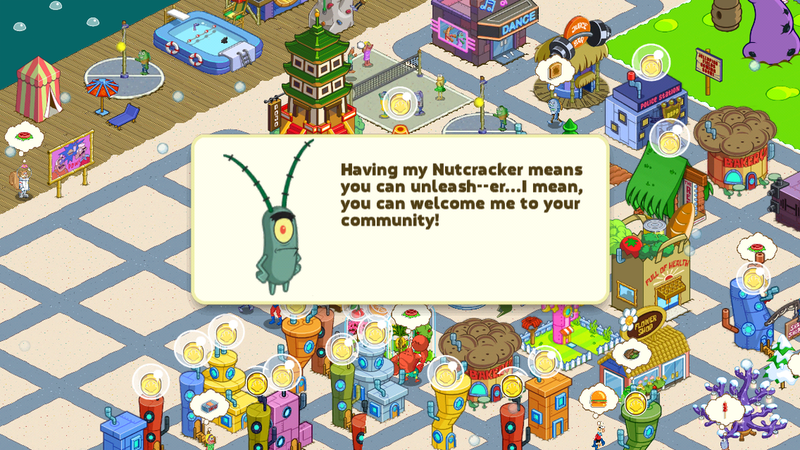 This time, we have several new (and really cool) decorations themed after Plankton, from the Drive-thru sign featured in "Chum Bucket Supreme", to the Original "Mini-Sized" Chum Bucket Mr Krabs mentioned early in the quest line, you can finally move em' into your town! 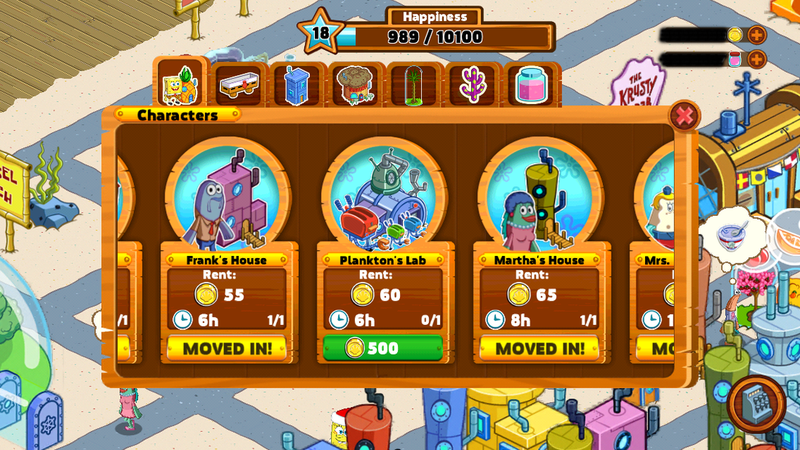 Why not create a special Plankton Village! Anyways, we'v listed down all the new decorations below for your reference. We currently don't know whether the decorations are limited-time only or if they are here to stay, but only time will tell! Patchy's Town is back in business! On a more minor yet exciting note, Patchy's Town has returned to the game after being remove shortly after its launch in early November 2014. Nothing new has been added to the town yet, nor are there any new "Patchy's Town"-related quests. Wouldn't it be great to see Patchy's Town themed after the SpongeBob Movie in February? We'll see! Q: How do I get chum? 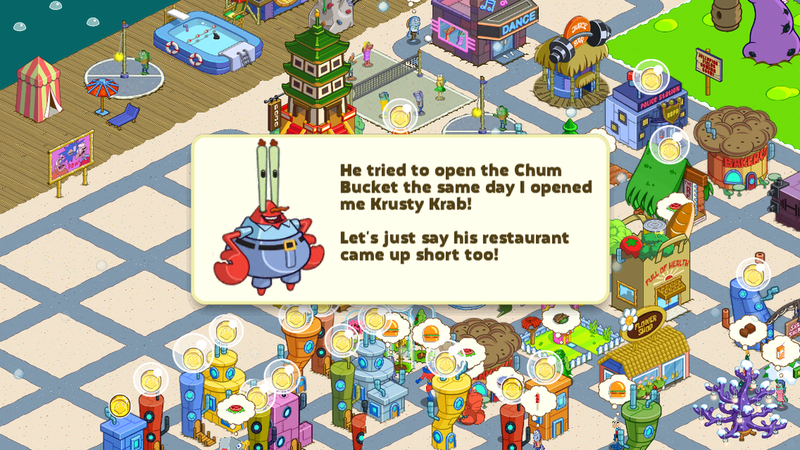 A: Move in the Chum Bucket and follow the quest line to get Chum. 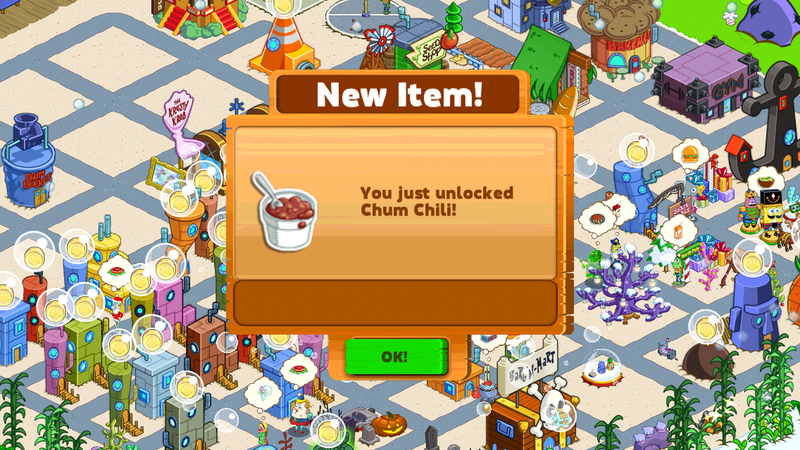 You will have to at first purchase the Chum Chunks from the Barg-N-mart and then Plankton will create the Chuminator that will create the ingredients to make recipes at the Chum Bucket. Keep feeding Plankton and any of the few that may want Chum recipes to get more Chum Recipes. Q: I cannot find the Nutty Plankton, where did it go? A: Please check your inventory for the Nutty Plankton, the inventory is the suitcase and it's in alphabetical order. If the item isn't there, please look in your Bikini Bottom in case you put it in there somewhere. If you can't find it, please submit a Ticket or email appsupport@nick.com with your game tag so that Nick Mobile Support can investigate further. Q: Where did Plankton go? A: Plankton is small, but he bounces around Bikini Bottom to make him stand out. He will be one of the very few people who wishes for Chum recipes and if you sent him on a task he will be in his Chum Bucket. Q: Why can’t I feed Plankton? A: Plankton is not allowed to eat any Krusty Krab items, because he will steal them. So you will not be able to feed him anything from the Krusty Krab, he strictly eats Chum Bucket food items, somebody has to!